Visitors are welcome at the New Hampshire Fish and Game Department's fish hatcheries and education centers. Group visits require a reservation. The mission of the center is to educate people in the knowledge, skills, and behaviors required to become safe and responsible hunters, trappers and stewards of the state's natural resources. Owl Brook offers a modern classroom, shooting range, archery course and self-guided interpretive trails covering topics such trapper education, hunter education, map and compass, and wildlife habitat management. Summer and group programs for youth. Learn more about Owl Brook Hunter Education Center. 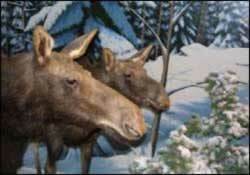 Cow and calf moose -- two of the many critters you'll find at Fish and Game's Discovery Room. The Discovery Room at Fish and Game's Concord headquarters is a window on New Hampshire's great outdoors ... complete with a life-sized moose cow and her calf! This exhibit depicts a variety of New Hampshire landscapes and wildlife. Come explore the sights and sounds of New Hampshire's wild places, including a pond, stream, beaver pond, meadow, woodland, vernal pool, boreal (spruce/fir) forest, and even a typical back yard. Visit the Discovery Room: Located at NH Fish and Game headquarters, 11 Hazen Drive, Concord, NH, the Discovery Room is open from 8:30 AM to 4:00 PM on weekdays. Groups should call first to make arrangements -- (603) 271-3211. Part of Great Bay National Estuarine Research Reserve, this center provides opportunities to learn about coastal and marine life. Indoor exhibits and self-guided nature trail along a boardwalk through the salt marsh. Call for hours of operation. School programs by arrangement. Summer programs for youth and adults. For more information, go to greatbay.org/about/facilities.htm. New Hampshire's Fish and Game fish hatcheries are a great place to learn about how fish are hatched and reared. 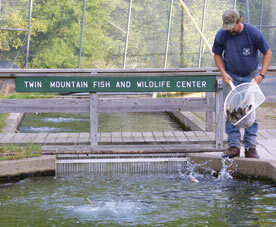 These facilities raise nearly a million trout each year! Hatcheries are open year round, from 8:00 a.m. to 4:00 p.m. Outdoor fish viewing is available throughout the year. Guided hatchery tours are available by reservation. You'll enjoy meeting our dedicated, hardworking hatchery staff, who not only understand the technical challenges of raising fish... many of them love to fish themselves! 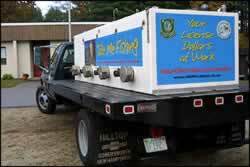 Milford's fish transport truck makes the rounds in southern New Hampshire. Hauling fish from hatchery to water requires specialized, oxygenated tanks.